"You'll love this silky-smooth dessert." Bring cream, 1/2 cup sugar and lemon zest to a simmer in a large saucepan over medium-low heat. Meanwhile, in a small bowl, soften gelatin in 2 generous Tbs. cold water. Whisk softened gelatin and 2 Tbs. orange liqueur into cream mixture. Pour cream mixture into 8 4-ounce ramekins or custard cups that have been lightly coated with vegetable cooking spray (blot excess oil with a paper towel). Set custard cups in a shallow pan, cover with plastic wrap and refrigerate until set, at least 4 hours, preferably overnight. Partially thaw raspberries on countertop. Place in a food processor fitted with the metal blade and add remaining 6 Tbs. sugar and 2 Tbs. orange liqueur. Transfer sauce to a medium bowl (if you want a seedless sauce, strain first through a fine-mesh sieve). Stir in fresh raspberries, and let stand about 1 hour. When ready to serve, run a thin-bladed knife around each dessert to loosen; turn onto a dessert plate to unmold. 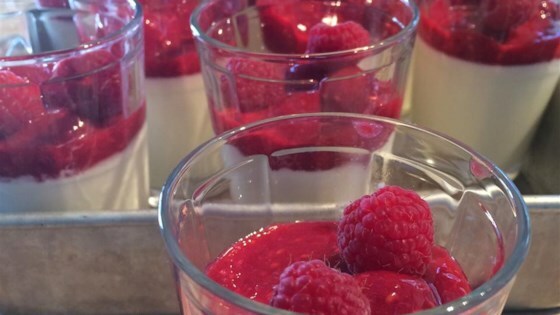 Spoon raspberry sauce around panna cotta and serve. The loveliest of summer desserts. Delicious! but I'll add a little more lemon next time. Soooooo good. It's very simple to do so I probably make it far too much! The only thing I do dfferently is substitute orange juice for the liqueur. Fantastic for those who like orange liqueurs. This is my absolute favorite panna cotta recipe and there are many out there. Thanks for putting on this site. Great recipe, very fresh tasting even without the carton of fresh raspberries. I added a teaspoon of pure vanilla extract with the geletin, just for a little more depth of flavor.